What are a few good Thanksgiving pairing ideas? Our 2018 Thanksgiving Pairing Flyer has your answer. 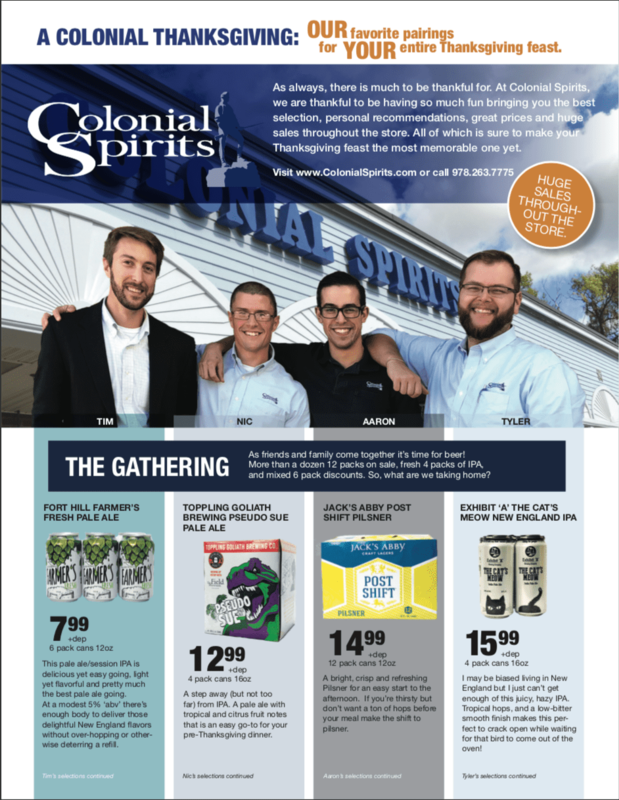 Handpicked by Tim, Nic, Aaron, and Tyler are a few Thanksgiving beverages that you are certain will garnish their table tops. From craft beer to great wines to the elixir of the gods, whiskey, there is definitely something you will enjoy. As many of you know, our ‘Wine of the Month’ display, just beyond the entrance to the store has earned a reputation for delivering great value. We seek out wines that you may not have seen before but offer exceptional quality. 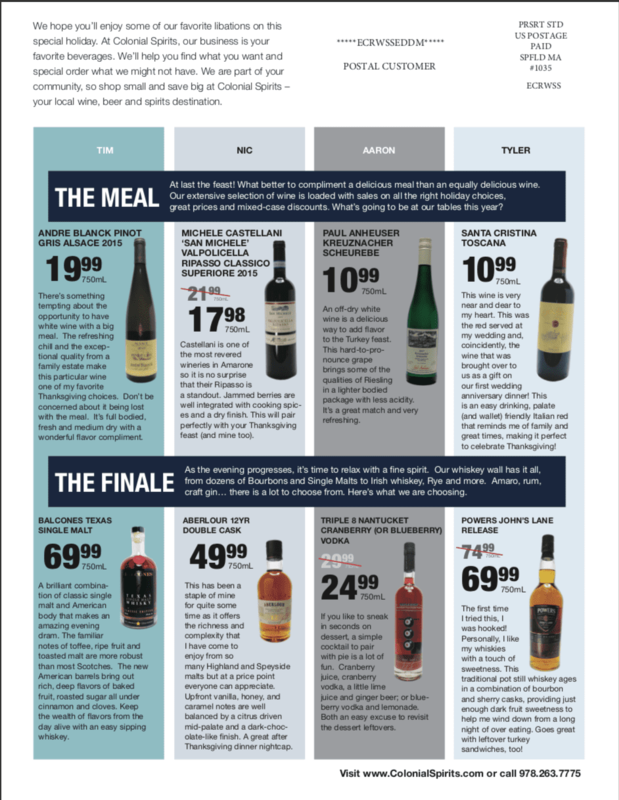 Exploring wine should be fun and our wine of the month makes trying something new easy. To sweeten the deal even further, we always offer these value-driven wines at a special discount, and right now we’ve got… Le Coq Rouge, regularly $11.99, ON SALE FOR $9.99 PER BOTTLE AND $90 PER CASE ($7.50/BOTTLE)! Seghesio Sonoma Zinfandel 2013 – Lowest Price in Years! “A lively, zesty red that offers bright cherry and tarragon aromas and sleekly layered flavors of briary raspberry, nutmeg and fresh-cracked black pepper. Drink now through 2021.” – 92 points! This has been one of the best Zins I have tried as of late, but if you consider the price it would be the best Zin I have tried in a while. 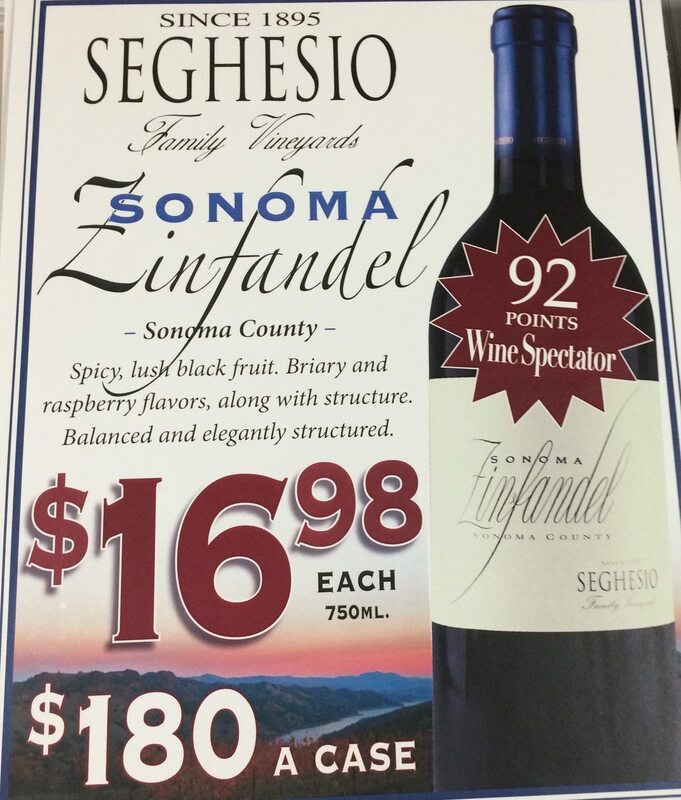 The Seghesio Zinfandel Sonoma normally sells for $22.99 per bottle, we currently have it at our Super Savers price of $16.98, but if you buy it by the case you only pay $180 for the case ($15/bottle). You just can’t beat that price. But act quickly because this wine will sell out fast. Carpe Vinum! To purchase this wine online for delivery to most Eastern Mass locations or for pick up at our Acton store, see the Seghesio Sonoma Zinfandel 2013 page.